Has the Christmas baking bug hit your house, yet? I’m dying to start baking cookies and fudge but I have been playing catch up from Thanksgiving. Traveling for the holidays can be exhausting and it seems like it takes me a couple of days to get back into my routine. 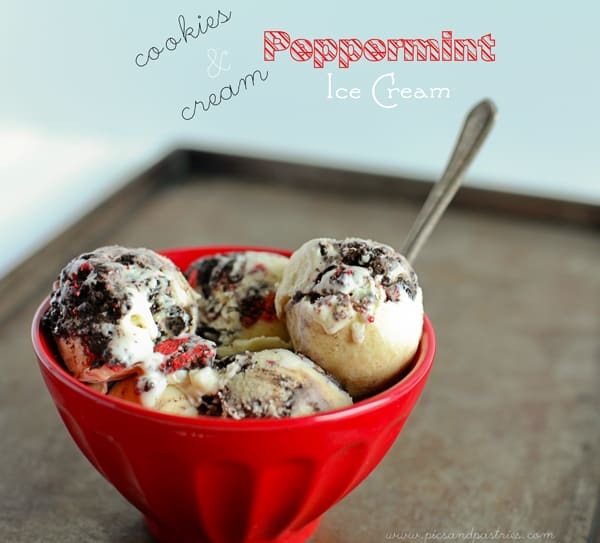 So, today’s recipe is not of cookies or fudge but a Christmas ice cream treat! It was easy for me throw together since my mixer did most of the work. If you follow me on Instagram then you saw the picture of the Candy Cane Oreos that I posted. I love peppermint and have a weakness for oreos so I knew I would fall in love with them! As badly as I wanted to eat en entire sleeve of them in one sitting I resisted the urge knowing I wanted to make ice cream with them. I used the Pioneer Woman’s ice cream recipe and added the crushed up oreos. Depending on where you live it may be too cold to make ice cream. JUST KIDDING! Is it ever too cold to eat ice cream?!!? 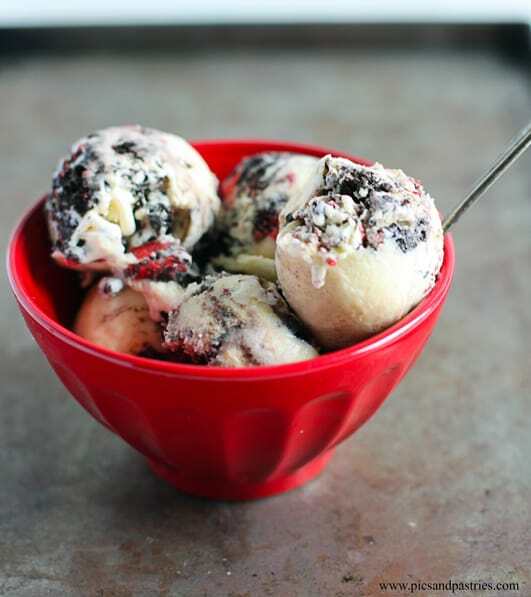 Just scoop some ice cream in a bowl, put on your fuzzy socks, grab a blanket and enjoy! This is what I use to make my ice cream. Pour the half-and-half into a heavy saucepan. Add the sugar and stir to combine. Bring the mixture to a simmer over low heat, stirring occasionally. In a separate bowl, beat the egg yolks until they're light yellow in color. Temper the egg yolks by slowly drizzling in about 2 cups of the hot half-and-half mixture while whisking quickly. Pour the tempered egg yolk mixture into the saucepan, whisking gently as you add it. Simmer over low heat until it gets very thick, 5 to 7 more minutes. Pour the mixture through a fine mesh strainer into a medium bowl, pressing with a spoon or spatula to gently force it through. Pour in the heavy cream, then stir to combine. Stir in vanilla. Cover and refrigerate this mixture until it's totally cool. Freeze the mixture in an ice cream maker according to its directions. After the cycle is completed, stir in the crushed oreos and immediately transfer to a freezer container and place in the freezer. A couple of hours later, open the container and stir again to make sure the candies are distributed. Freeze for another 24 hours or until frozen hard and solid.